Thread: Bi-Wiring, a waste of time? Does anyone feel like I do that in some cases bi-wiring actually is a step backwrds in sound quality, rather than using a single large cable with good connects? I have tried it and the sound became diffuse, the timing or meter was off, not coherent and the bass impact suffered greatly. I would be interested in you favorite speaker cable for single or bi-wiring if you had good results. At the moment I have original Monster that has about 30 years on it in parallel with some new 12 ga. in wall wiring from the same company.. I have ordered some new Monster XPHP to try. I try to keep cable lenghts to under 17 feet, so they do have some effect but not like 25 feet or more. Hey Jose. For me, I prefer to bi-wire my Kef Codas. The sound seems to be a lil more refined compared to using the jumpers. But it might all be in my head!!! Id definitely like to hear others people input on this. I think the quality of the jumpers play a part in any perceived difference. Also for many biwire cables like my own, the HF and LF portions of the cable are constructed differently. The type of wire, gauge and configuration can differ. I think it depends on these factors so it's situation specific whether bi-wiring will present any sonic differences...and if so, it depends on your ears which you like better. My speakers don't have jumpers so i didn't have a choice. I bi-amp the Legacy Focus mains in my primary system. Like Shodulic, I have Audioquest GR8, but not the bi-wire configuration. I use Monster THX cables for the bass portion. I like having more control over the bass using bi-amp over bi-wire. The Legacys have 3 12" woofers/ch, so I like the advantage of using a more robust amp (Yamaha M-65) . I had the HF/Mid connected to a Sony STR-DA5300ES 140W/ch receiver. I also have an Emotiva XPA-5 5ch amp. I tried using it to bi-amp both mains, but didn't like the bass reproduction. I kept the front HF/Mid connected to Emotiva and have the side/rear surrounds on the Sony. I thought using three different amps may cause differences in the sound, but I haven't really noticed any degradation. With the mains and center off the Sony, it frees up the power supply, so there's no shortage of power to the surrounds. I like the GR8s and got a great deal on them through Have Inc at $99 12'pair. At that price I purchased enough for two HT systems. With the option of using different colored nylon sheathing, it made wire identification much simpler. I'm not sure about your systems, but mine gets complicated when trying to reconfigure. I use black for the mains, red for the center and blue for the surrounds. I don't have much room behind my rack, so locating connections can be difficult. I also keep a printout of my components close to the system for reference. I've only tried bi-wire once using the internal passive xover, but didn't hear any real benefit. From what I've read, to get the most benefit out of bi-wire an external active xover is necessary. I bi-wire my Monitor Audio RS6's and find it an improvement over single wire with supplied jumpers. I have not yet tried a higher grade of jumpers to hear if it is the quality of the jumpers or the benefits of bi-wiring. I am very happy with the AudioQuest Slates that I purchased as bi-wire cables and since I have them I can not see a reason to go back. I would guess that when most people bi-wire they don't just double up on the same wire that they were using to begin with. They also upgrade the wire at the same time. This may add to the confusion. I used to think bi-wiring was a waste of time and money until I actually purchased a bi-wire cable set, Chord Carnival Silver Screen, and bi-wired the speakers I had at the time which were Usher S-520's. Much to my delight and surprise the musical presentation became much more enjoyable to me. I also bi-wired a pair of KEF IQ3's with the CCSS but I never did enjoy the Kefs with any type of wire so bi-wiring did not change a thing for me with regard to Kef speakers. My favorite speaker cable is a custom cable made by my buddy who builds custom cables and also owns a hi-fi shop, Blue Marble Audio. Now, his cables are kinda pricey which is why I never bought them but to answer your question his I.C's and speaker wire is some of the best I've ever encountered and is a system changer IMHO. But rather than spending big bucks on experimenting with wire... why not test with less expensive wire...I use 30 gauge Insulated Wrapping Wire from Radio Shack for my HT speaker system. A spool of 50 ft will cost about $5.00 and then you'll need to also get a Wrapping Wire stripper that will cost about $8.00 or so. At any rate... I just strip the ends and go bare wire into the HT receiver and also bare wire to the speaker posts. You can also make your own jumpers and listen for any differences. I use 30 gauge Insulated Wrapping Wire from Radio Shack for my HT speaker system. A spool of 50 ft will cost about $5.00 and then you'll need to also get a Wrapping Wire stripper that will cost about $8.00 or so. At any rate... I just strip the ends and go bare wire into the HT receiver and also bare wire to the speaker posts. You can also make your own jumpers and listen for any differences. Isn't that a little small, even for HT? I'm afraid that may be causing an overall increase in resistance (impedance) if your cables are that thin. I wouldn't recommend any thinner than 18, personally. They are more than small, they are quite tiny and handling the wire loosely usually leads to a wire nest similar to fishing wire that has gone off the spool. I use approx 5 ft. of wire for each of the front speakers, and approx 45 ft of wire to each of the rear speakers. I have no problem with the hi end or mids though the bass can be a loose but still low and it's kinda grainy. In my case, I have Mirage Nanosats so I have the bass cut off at about 110 on the subwoofer. But simply for the purposes of simple and inexpensive wire comparison...why not check it out. I replaced the Mapleshade speaker wire, $90.00/ 8 ft pair, with the R.S. because the R.S. made the system sound better, IMHO. Not sure I get you. Are you saying I should try using thinner cables? Or are you saying that you will try using thicker cable? I think he is saying he switched to a thinner cable and he is getting a better sound than he was with the more expensive "audiophile" type cable. I've used 14 gauge my entire life, so I am inexperienced when it comes to knowledge of wire. Sorry for the lack of clarity. On the HT system only, I switched from the thicker more expensive solid core Mapleshade speaker wire to the much thinner/tiny R.S. wire and got better results. What I was attempting to state in a general....is that anyone wanting to determine if better system results can be achieved by using different speaker wire then it may be in their best interests to first try an inexpensive wire and give it a listen. By the way, I also found the R.S. wire to also best the Reson DNM speaker wire I also had at the time. I think the Reson DNM was or is sold at about $10.00 per foot and I had an 8FT/pr. I have since gifted the Reson and Mapleshade wire to my nephew's as I did not have the fortitude to throw them in the garbage (which is where I think they really belong). Isn't that a little small, even for HT? I'm afraid that may be causing an overall increase in resistance (impedance) if your cables are that thin.. If you look at 30 guage resistance per 10 ft. (1.02 ohms) , 45 ft of 30 guage cable's resistance for speaker wires will be around 4.5 ohm which is alot. You are basically wasting half of your Amp's power output on cable resistance alone. Sorry LeRoy, I just don't see how 30 ga wire can be better than your thicker expensive cables. It just doesn't make sense. I wouldn't say anything if you didn't think it made a difference (or if you said the 30ga didn't sound as good) but to say that it sounds better is a bit like saying that you prefer reformed ham to the real thing (sorry for the stupid example nothing else comes to mind right now). Granted you may prefer the taste of the reformed ham but clearly the real thing is better at every level. It is a situation where only the people with poor taste (for example those who would like the appealing and unatural sound of Bose speakers and don't know any better) would prefer the reformed meat. Now I'm not saying that you like Bose speakers but there's all the evidence (scientific too in this case) that 30 ga is not going to communicate the signal as well as thicker gauge, especially at those lengths. It's like when people buy CDs and then make a copy because they say the copy sounds better... I mean, how rediculous is that? See where I'm getting at? I understand the skepticism. It's true the resistance is quite a bit. However, it's also true, for whatever reason, the tiny R.S. wire made an improvement in overall sound presentation over the Reson DNM and Mapleshade wire. I think I may have benefited by the fact that the speakers are satellites anyway so not much juice needs to go to them since the subwoofer takes care of the low end. As hard as it is to believe, it simply worked or works for me in my HT set up. Of course I could replace the R.S wire which costs only a fraction of a penny per foot with much more expensive wire like the Chord Carnival Silver Screen which is about $8.00/ft but the gain would only be for music and I don't listen to music via the HT system. Hello A.A...your skepticism is well founded.. I too was skeptical until I tried it. I'm not trying to imply the R.S. wire beats out most or many other thicker speaker wire. I know my Chord Carnival Silver Screen wire is a much more musical speaker cable than the R.S. wire but much in the same way the R.S wire is a better conductor than the Mapleshade and Reson DNM. With regard to reformed ham ( I liked that example), in comparing the Mapleshade and Reson DMN conductors to the R.S. wire it's the former that sounded reformed which is why I got rid of them. Since the length of wire for my surround satellite speakers is approx 45 ft, I gave them a 4 db boost from the Arcam receiver and they get plenty loud and special effects sound great. Also, I have the subwoofer kick in at approx 110 db the sub gets most of the juice anyway. I know what you mean with regard to copied CD's. I can't stand to play a CD copied from a PC. My audio buddy has an Alesis CD burner stand alone unit and I am going to have to borrow it to burn copies and see if it can copy as good or better than the original. You know, every time I post something about the R.S. wire I always get some grief about it so I am used to it....lol.... It's cool though. It's hard to believe, I know. what I don't understand is, because you feel the RS sound better to your ears, it means the RS are a better conductor? This is what I understand from what you said. But wouldn't you agree that a thicker cable will be a better conductor and thus, will sound better? Either way, I stand to my point, but I accept that you may prefere the RS. After all, you're old/savvy enough to know what you want! Last edited by audio amateur; 02-07-2010 at 07:41 AM. Hmmmm, 30 AWG stranded presents many problems, certainly enough to outweigh the benefits, perceived as they may be. Impedance is a huge factor and that's without considering distance. I think the other main problem would be loss of bass response. From everything I have read, if you want thin and affordable, you should switch to solid core Leroy. I am in the process of breaking in some 18 AWG solid core. It's incredibly thin. Stranded has so many fundamental issues, why add another? A.A.- I respect that your stance on the point and understand why. I don't mean to imply the R.S. Insulated Wrapping Wire is the best conductor out there. Heck, it's not even marketed as speaker wire by R.S. and upon close inspection I don't even think it's made of copper and feels to the touch like it's braided. 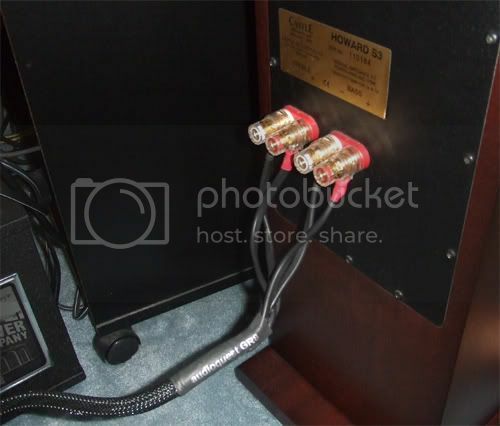 Nevertheless, it's a less expensive option that can produce better results than some higher dollar boutique cables such as Reson DMN and Mapleshade.. No, the R.S. wire is not going to produce better results than wire from Chord or Kimber as I've heard these wires in a system and they are much, much, better than the R.S. So, in theory, the R.S. wire is an inferior conductor, however, in play, they are capable of producing better results than some of the boutique cables out there. I agree that there are much more refined/better conductors than the R.S. Wrapping Wire at whatever gauge they may happen to be ( which should be in all cases much larger than 30 gauge). It wasn't age or savvy that led me to this wire. It was a review of 30 gauge wire that I read up on at Enjoythemusic.com which led to the Wrapping Wire and I bought this W.R. quite literally by accident. Anyway, surprisingly, it's worked out quite nicely for my H.T. Ya, I understand the problem of resistance in these tiny wires but there is no loss of bass response. 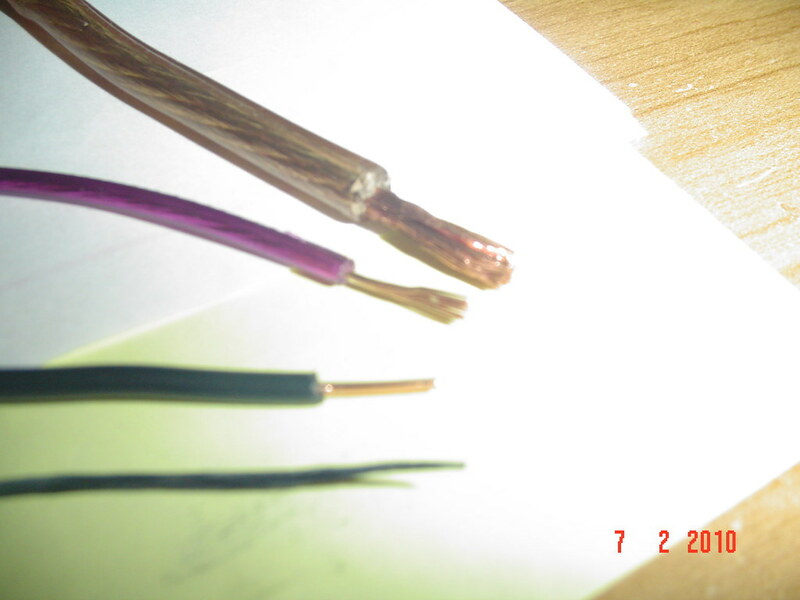 In fact, in comparison to the Mapleshade and Reson DNM wire I was comparing them to at the time....the R.S. wire had more bass though I thought it was loose yet deeper than what the M.S or DNM was producing. I know none of it makes sense but that's just the way it was or the way it went. I know it sounds like such major B.S. but what can I say other than it just works....I can't tell or say why exactly but it does. I think the wrapping wire is made to be a conductor of internal wiring of electronic components so maybe the material that it's made of has something to do with it? Anyway, at a later time, I will go digging around the Enjoythemusic websiste and try to find the article again and post the link. Well, off to get started on Super Bowl Sunday festivities...never to early for that. Have a great day fella's. Hey guys. I put this together as I wanted to try and understand how thin 30AWG would be. Must be on par with detal floss, which BTW, I coloured with permanent marker for visibility. I love how you named it dental floss Nice job! It really is dental floss. I just coloured it with black marker for the photo. 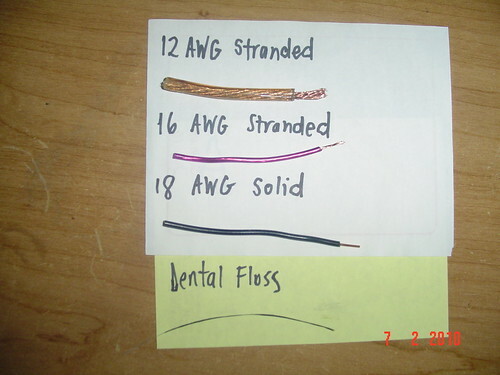 The exposed wire itself is approx 1/3 the width of the dental floss. Amazing that such a tiny wire can deliver a signal but it it does.